SAVE up to £17.95 on this season's 'must have' summer blooms! 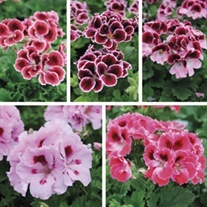 Pelargoniums create beautiful summer displays, whether you grow them in the garden or indoors. The bright colours of their large trumpet shaped flowers contrasts well against the velvety green foliage. This season we are excited to bring to you our much loved Elegance and Mosquitaway series. Both easy to grow and care for, they are a real summer must have! 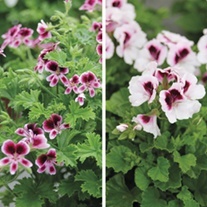 The Elegance series resembles the old fashioned types grown in Victorian times – however, these new hybrids have a lot more flower power and will provide colour from early summer through to frosts. Mosquitaway, not only flowers profusely, but the foliage has a glorious citrus fragrance which helps deter mosquitoes. The flowers are intricately patterned and look delightful displayed in pots on the patio or as houseplants on a windowsill, where they will bloom for 12 months of the year! What’s more, take advantage of our limited 3 for 2 offer across both collections. Plus SAVE an additional £6 when you order 2 or more of the Elegance collection - paying just £17.90 for 15 plants! Just add all items to your basket and quote code F19EPEL at the checkout. Buy 2 packs and SAVE £6!